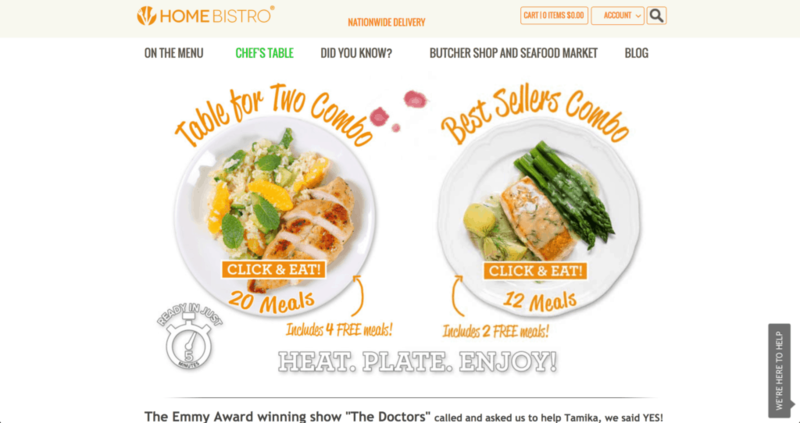 Home Bistro Review: Are These Fresh Flash Frozen Meals Worth Buying? By now, you’ve probably heard all about the various meal delivery services that are available today. They’re all designed to make preparing meals easier for you, but one company does it in a totally different way. While many send you ingredients for you to prepare meals yourself, Home Bistro aims to make meal delivery even easier. What originally started out as a small company based out of New York, Home Bistro expanded after being acquired by their largest competitor, DineWise, in 2009. Since this acquisition, the company has grown to serve customers all over the United States. They now provide even more homes with delicious meals that are fresh and easy to prepare. The reason Home Bistro is so unique when compared to other meal delivery services is because all of their dishes are prepared fresh and then instantly flash frozen. Now, that doesn’t mean you aren’t getting fresh food because you certainly are. Home Bistro uses only the freshest produce and high-quality cuts of meats, all of which are hand selected by the company’s chef. This ensures every meal you receive from them is the best quality possible. Because these meals are flash frozen, you really don’t have to put in much work to prepare them. All you have to do is heat them up and they’re ready for you to eat and enjoy. Their kitchen is also run by a Certified Executive Chef, which is a certificate that is presented by the American Culinary Federation. This is actually one of the highest standards a chef can receive and something not many chefs in the nation are able to achieve. With a skilled chef behind the meals at Home Bistro, you’re guaranteed to get restaurant quality food in the comfort of your own home. Whether you’re looking for gourmet meals, healthy options, or dinners that fit your specific dietary needs, Home Bistro has something for you and your family. They take pride in hand crafting their meals with only the freshest produce and the highest quality of meats so you can enjoy something delicious every day. What is the different between Home Bistro and a frozen dinner? Are their chickens and cows raised without hormones and antibiotics? How often does Home Bistro deliver? Is their a return policy? Do they offer gift cards? If you’re interested in signing up for Home Bistro, you’ll want to get started by creating an account on their website. Having an account allows you to have a faster checkout process, allows you to quickly reorder your favorite meals, and gives you the option to track your orders and view order history. Once you’ve signed up, the next step is to start adding your desired meals to your shopping cart. With Home Bistro, you have plenty of options to choose from. This is much different from other meal delivery services that only provide you with a few options to select each week. This ensures you get exactly the meals you want, so choose the ones that fit your tastes and diet. To see the current meals that are available, select the “On the Menu” option from their website’s navigation bar. From there, you will see a listing of all the meals that are available at the present time. You can narrow down your options by selecting your preferences on the sidebar. You can choose from healthy gourmet, heart-friendly, diabetic-friendly, cancer support, vegetarian, lower sodium, gluten-free, paleo, and low carb. Once you’ve made your desired selection, scroll through the available recipes. If you see one you like, select “More Details” to get all the information about the dish. You’ll find a full description of the meal, cooking instructions, ingredients, allergen information, and nutritional information. If you’re ready to purchase, click “Add to Cart” or you can save it to your wish list to come back to it at a later time. After you’ve filled your cart with all the delicious meals you want to order, you can begin the checkout process and start counting down the days until your food arrives on your doorstep. It really is as simple as that! One of the great things about Home Bistro is that they provide a lot of options many other meal delivery services don’t have. This means you’re able to search for the best recipes for your unique diet. As mentioned above, you can choose from the following options: healthy gourmet, heart-friendly, diabetic-friendly, cancer support, vegetarian, lower sodium, gluten-free, paleo, and low-carb. There are plenty of options for anyone to choose from, so you’re sure to find something that suits your needs. Not only are you given options for the types of food you want to choose from, but you can also select combos (which Home Bistro says provides their best deals), individual entrees, and SUPERBowls (meals that can be taken anywhere). All you have to do is select your ideal options and add the meals you want straight to your shopping cart. Home Bistro promises to provide reliable delivery service for all of your meals. Each order placed is hand-packed and is shipped out via local couriers or through FedEx. Orders will ship out within three to six business days from the day your place your order. You can expect deliveries to arrive between 8 am and 8 pm on the day of arrival. There’s no need to be home during the time of delivery, so you don’t have to worry about waiting around for your order to arrive. This also means that your signature isn’t required in order to drop off items. Deliveries can be made to all of the contiguous United States. This does, however, exclude Alaska and Hawaii at the present time. Orders also cannot be delivered to P.O. boxes, so you’ll need to provide a home address. Because it’s important to keep your food items cold and fresh during delivery, everything is shipped in insulated boxes. These boxes are designed to keep everything cold, so there’s no need to worry about anything spoiling before it arrives on your doorstep. Inside the box, you will find dry ice to keep everything cold. Sometimes the dry ice may melt before the package makes its way to you. If the food is still “refrigerator cold” to the touch, Home Bistro says everything can be safely stored in your freezer. It won’t reduce the quality of the food and will still be safe for you to consume. Home Bistro prides themselves on providing fresher, better-for-you options when compared to standard pre-made meals you’ll find in the grocery store freezer section. The recipes they offer are based on a Mediterranean diet and all the ingredients are natural and locally sourced. The produce used in each meal is farm-fresh and harvested at the peak of its maturity and flavor, which ensures everything is more flavorful for you. 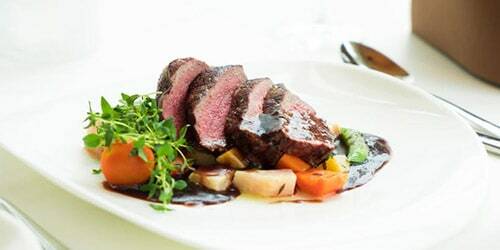 All meats are locally sourced and the chefs at Home Bistro hand-select them to ensure everything is high-quality. The chicken they use is all-natural. The chickens were born and raised within the United Sates on cage-free family farms and fed a hormone and steroid free diet. Everything is 100% antibiotic free and 100% vegetarian fed. The beef used in their meals is also born and raised within the United States. It comes from cows that were fed vegetarian diets without any animal by-products, antibiotics, hormones, or anything that promotes animal growth. Overall, the food Home Bistro provides is, in my opinion, restaurant quality. With the best of produce and meats, you can be assured the meals you order are going to taste great. Each meal contains real ingredients as opposed to the preservatives other frozen dinners often contain. Although they are a frozen meal delivery service, they promise freshness and you can expect to get that with each order your place. When it comes to preparing the meals from Home Bistro, it really couldn’t get any simpler. Unlike most food subscription services that require you to actually cook the meal, Home Bistro creates your meals and flash freezes them so they stay fresh for you. This also means they’re very easy for you to prepare. In fact, you should be able to prepare and cook many of the meals in less than 20 minutes. You can choose to reheat meals in a warm pot of water or simply place them in the microwave to warm them up. It won’t take any time at all before you have a fresh, delicious meal ready for you to eat. With fresh produce and high-quality meats, there’s no doubt that the Home Bistro meals taste great. All you have to do is choose the dishes that are most appealing to your tastes and your diet. There truly is something for everyone on their menu. The Beef Pot Roast is tender and makes the perfect pairing with side dishes such as mashed potatoes and some green vegetables. They also make a great BBQ Beef Brisket which has a tasty sauce and some top-notch, juicy beef that won’t stay on your plate for very long. You can also choose from Roasted Crab Cakes that come with a delicious Lobster Sauce, Shrimp Pomodoro that gives you the freshest shrimp there is, or a simple Spaghetti Bolognese that’s perfect for dinner and leftovers the next day. The most appealing thing about Home Bistro is that you are in full control of what you order. There’s no set price you have to pay each week, like many other food delivery services, so you can pick and choose which meals you want and how many you’d like to purchase. It’s entirely up to you! With other services, you’re required to select a certain amount of meals each week, which can get pretty costly. Plus, you have to remember to skip the week on those plans if you’re not interested in placing an order. With Home Bistro, you only have to order when you want to. All of their prepared meals are priced per serving. A single side dish starts around $9. The various cuts of meat they offer can go up to $20 for a pack of chicken breasts. Home Bistro doesn’t provide a listing of their prices on one page, so you’ll have to look at individual pricing for each of their entree items. While that is a little inconvenient, you do have the convenience of being able to pick and choose what you want so you can set your own budget and go from there. Below you will find the most common questions people have asked regarding Home Bistro and our answers. Since Home Bistro meals are flash frozen to secure freshness while in transit, many people assume that they are the same as the frozen meals you buy at the store. That couldn’t be farther from the truth! The meals that Home Bistro sends you are much fresher than any frozen food you can find at a super market. Yes, their chickens and cows are raised without hormones or antibiotics. They are also 100% vegetarian fed as well as born and raised in the United States. Home Bistro can deliver as frequently or as infrequently as you’d like. They only send deliveries Wednesday through Saturday. Yes, and it is quite good! Home Bistro has a 100% product satisfaction guarantee. That means if you don’t like what they send you, you can request a refund or replacement. Yes, you can order Home Bistro gift cards on their website. Overall, the meal delivery service Home Bistro provides is pretty impressive. Instead of resorting to the typical frozen meals from the grocery store freezer section, you can now choose to order flash-frozen meals that are made with only the best ingredients. There’s no reason to sacrifice quality any more by purchasing meals that are overloaded with sodium, preservatives, and other (sometimes questionable) ingredients. The fact that Home Bistro also provides a large selection of meal options is also appealing. If you’re on a specific diet (gluten-free or low sodium, for example), they have something for you. This is an option that many meal delivery services just don’t offer. Home Bistro is clearly creating their meals with you in mind by catering to your needs. Plus, they make ordering their food incredibly simple for customers. All you have to do is select the meals you want (as many or as few as you desire) and add them to your shopping cart. In a matter of days, you’ll find them waiting for you on your doorstep. It’s quick and convenient and ideal for anyone who wants healthy meals that are easy to prepare for themselves and their families. Home Bistro also strives to make sure everyone who purchases from them is happy, so they provide a 100% product satisfaction guarantee. If you aren’t fully satisfied with your order, they’ll replace the product or refund your money, whichever you prefer. I don’t know of many other meal delivery services that offer this good of a satisfaction guarantee policy. If you’re looking for a meal delivery service that gives you plenty of options and makes meal preparation as simple as possible, Home Bistro just might be the one for you! 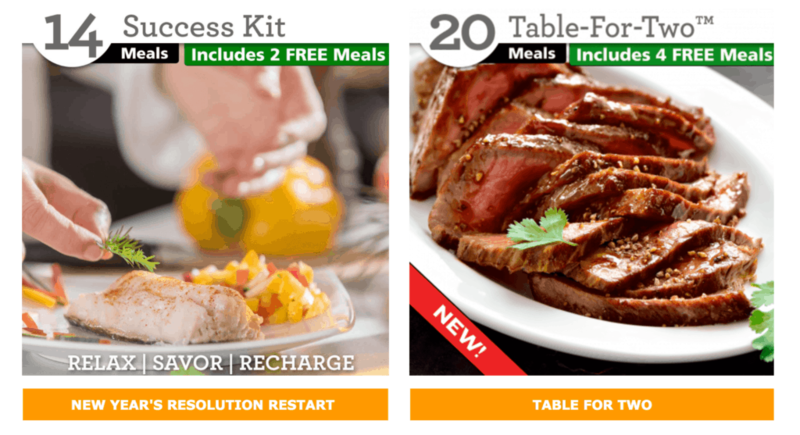 Home Bistro delivers pre-made flash frozen meals that are ready to eat whenever you are. This takes all the work out of prep and cook, allowing you to save time and still eat a good meal.